Thanks to Zoran Stajic for the info and pictures! Zoran says this model is a lot like the VIP400, but the Piano Sounds are different. Possibly the addition of some of the goodies from the Pro Piano??? Thanks to Eric, who posted this comment on the old site: Great Farfisa; much more versatile than Compacts. Sort of like a Compact with many more additional sounds and features. Used by Sun Ra (see Space is the Place video). One feature I particularly like is the percussion/ repeat. Sounds sort of like a square wave LFO, but with more attack (plus control over the attack). Also has “synthaslalom” which is a little like portamento on an analog synth. This feature can also be controlled in terms of time and range of the portamento. Unlike portemento, this effect seems to only go up, elevating the note till it reaches the note of the key. Also has very cool reed/ string like drawbar that sounds like a strings preset analog synth. The other effect in this section is “piano”, which sounds vaguely like a dark electric piano tone. Incredible Bass section for lower quarter of first row of keys. drawbars for very round/ super bassy square wave “bass” and a reedier, fuzzy tone also (think: bass sounds on Suicide’s first album) All in all a very expressive and versatile keyboard capable of the 60s psyche farfisa sound as well as some basic (but well done) 70s analog synth sounds. This was a very professional, and expensive keyboard in it’s day. I believe I saw an mid 70s advertisement for $1800!!! More than a MiniMoog. Cool keyboard. 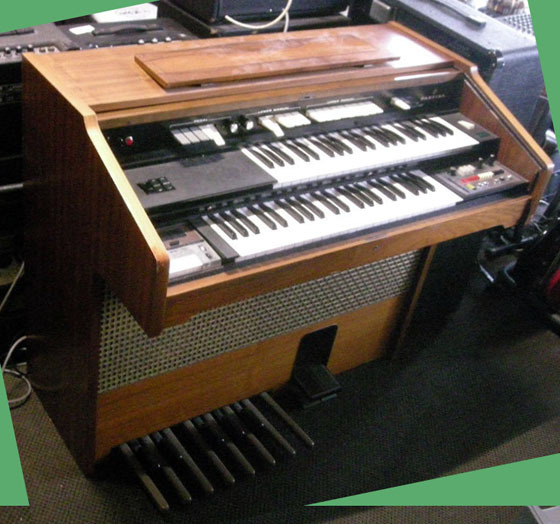 Need to learn how to tune that brand new Farfisa organ that you rescued from the craigslist? Well, look no further. Check out this excellent video from Vintage Vibe. In it, they tune up a VIP 233, but fear not, the premise is the same for most of the combo organs.